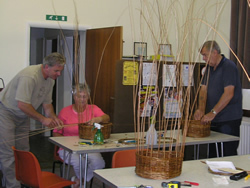 A Basket Making Course was held on Wednesday 12th September 2007 in the Recreation Room from 10am to 4pm, organised and funded by the History Group. Skilled Craftsman Raymond Lister who was assisted by Samantha Pearce ran the course. 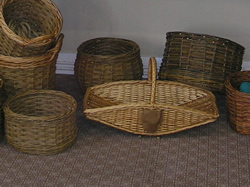 They bought along a wide variety of baskets of different shapes, sizes and materials to show just what could be achieved once someone became more experienced. They gave an interesting talk on the tools and materials used in basket making and were friendly, helpful and patient with their instructions as everyone got to grips with the intricacies of making a simple basket. Firstly a basket base had to be made then the side stakes were added which became rather difficult to manage and required a little more space with some people briefly moving outside to work. These side stakes had to be tied together at the top before weaving of the sides could begin. Finally with the sides reaching the right height the top of the basket was finished off and the ends trimmed. 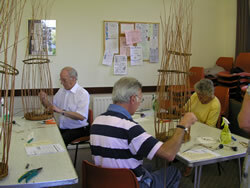 Nine people attended the course everyone managing to complete their baskets with Ray and Sam generously staying later than planned to help them finish. All seemed quite proud of their achievements. Refreshments of tea, coffee and biscuits were provided throughout the day by the History Group. All were treated to a piece of a delicious homemade cake Sam had bought along, much appreciated by everyone. It was a most interesting and enjoyable day.